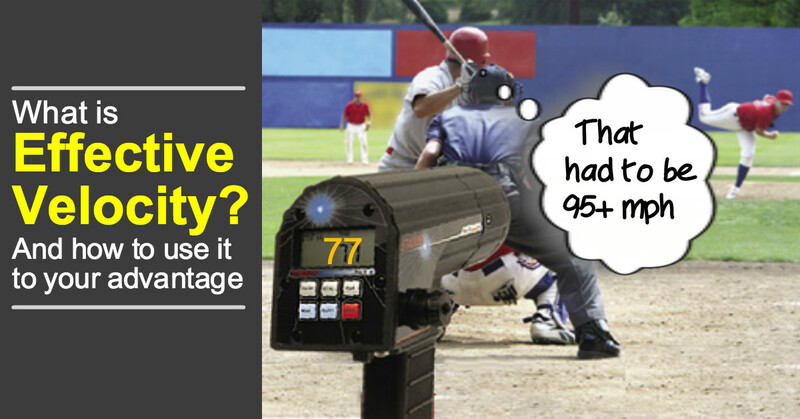 During an at bat, have you ever noticed how a pitch either seemed faster or slower than the speed on the radar gun? Here is a theory to explain why that happens. I was sitting around talking to a couple pitchers when a topic came up I never heard before, Effective Velocity. Come to find out this theory has been around for about 10 years but if anyone is like me and hearing this for the first time, you may find it interesting. Wondering which baseball practice net to get? We tested them. Click to check out our net reviews. A hitters perceived velocity is measured by a invisible diagonal line starting at the hitters shoes that move across the plate into the other batters box to the hitters shoulders. Every pitch that hits this line is seen to the hitter as the speed on the radar gun. For every 6 inches toward the hitter from this line the perceived velocity increases by 2.75 mph. For every 6 inches away from the hitter from this line, the perceived velocity decreases by 2.75 mph. Looks faster – If a pitch is thrown up and inside the strike zone, the perceived velocity can increase by as much as 5.50 mph. There’s a big difference between 92 mph and 97 mph! This started to make sense because as a hitter there are times when I see a pitch and it feels like its 80 mph but on the scoreboard it says 94 and vice versa. The location of a pitch (among other things, such as how well you are seeing the baseball, pitchers hide or don’t hide the ball etc.) has a lot to do with how fast the baseball appears to the hitter. In other words, a pitch often seems/feels faster or slower than its actual speed. The term “perceived velocity” is an attempt to quantify how fast the pitch felt to the hitter. So if a pitcher throws a 90 mph fastball down the middle, he can throw the same 90 mph pitch up and in and the hitter sees it as much faster than if the same 90 mph pitch is thrown down and away. The hitters perceived velocity also takes into account that when a pitch is away from a hitter he can wait longer and the bat doesn’t have to travel as far (contact is made over the plate). A hitter makes contact a foot in front of the plate on an inside pitch. This means on an inside pitch, the hitter has to make a decision quicker because his bat needs to travel further in order to make contact. Ie. The hitter has less time to react. How many times during a baseball season will a manager, pitching coach, or pitcher talk about “establishing their fastball” and the importance of throwing inside effectively? You’ll hear it said constantly, and here is the reason why. Once a pitcher can get inside, it opens up the rest of the strike zone and makes that fastball a LOT more effective at getting hitters out. Inside Edge did a study of Major League statistics showed that most MLB hitters are proficient at hitting 90 mph pitches, and were also pretty good at adjusting to pitches 3 mph more or less than that. That’s a 6 mph window of adjustability. However, once pitch speeds got outside of that 6 mph window, the hitter’s production dropped significantly. What does that mean for pitchers? If a pitcher can create a spread greater than 6 mph, it is going to make his pitching far more effective. So one way is to do that is to actually vary the pitch speed. 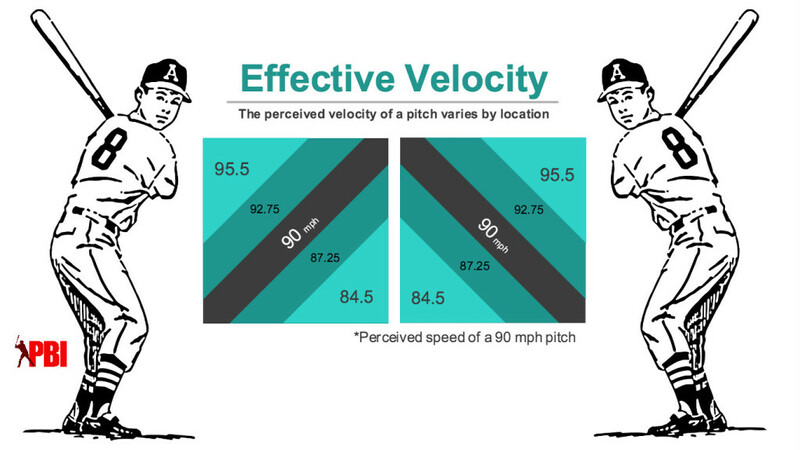 Another way is strategic, using this concept of effective velocity to deliberately use pitch location to your advantage. I believe most veteran pitchers understand this idea without knowing the numbers to back it up. The numbers that Perry Husband (the person that studied this idea) was able to produce by studying a ridiculous amount of pitches gave a reason why pitchers need to establish their fastball and especially be able to pitch inside. Since timing is so important to hitting, being able to use one pitch to disrupt a hitters timing by up to a 12 mph spread on the same pitch velocity can give a pitcher a plan against hitters. Just think of the options pitchers have to get hitters out, and we haven’t even introduced any other pitches. Having a basic understanding of “Effective Velocity” can help get the most out of your abilities as a pitcher even if their velocity isn’t world class. More Free pitching instruction from the pros? How to Throw a changeup – Former Minnesota Twins pitcher Anthony Slama shares tips for how to throw a changeup, including beginner to advanced grip variations. Pitchers Gear – 4 Contraptions to make a Pitcher’s life easier – what the pro pitchers who log hundreds of hours on the field are actually using. Just a few things that could make your life a little easier. Types of pitches – How to identify types of pitches, and know what each pitch does.